Today we celebrate the Solemnity of Christ the King. I’m afraid we Americans really don’t get this feast because we’re not used to dealing with a king. The United States is a democracy. We threw King George out over 200 years ago. Here in America, Elvis is the King of rock and roll. We know about Martin Luther King, B. B. King, and Carole King. As kids a lot of us watched “Sky King”. There’s Burger King, and Smoothie King, Larry King, and in hockey, there are the Los Angeles Kings. There was a big monkey called King Kong. And, for those of us who live in Saint Louis, there’s no question that Budweiser is the “King of Beers”. So what does this feast tell us about Jesus? It tells us that He is Lord of all. What He says goes. Jesus’ kingdom is not a democracy. He’s a benevolent king, but He’s still the boss. Wenceslas lived in the 900s. He became king because his father, then his mother, had been cruel rulers. With the support of the people he acquired land and started his own kingdom. He was a pious man to the point of growing the wheat and the grapes that were used for the Eucharist. Unlike his parents, the people loved him. He became a martyr in 938 when his brother attacked him as he was kneeling in prayer. King Louis lived in the 1200s. His father became king when little Louis was just nine years old. 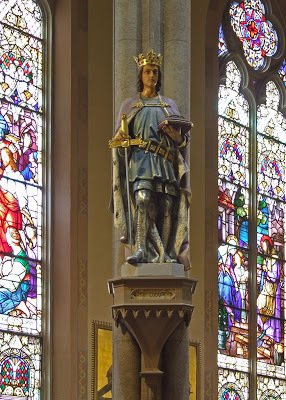 He died just three years later and our Louis, Louis IX, became king of France at the age of 12. He ruled over his kingdom during the height of its influence, sometimes called France’s “Golden Age.” It was a time of great prosperity and freedom for the people. Louis is often referred to as a model for other monarchs. During his reign, he was the most powerful man in Europe. 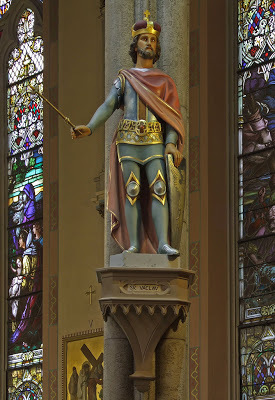 He died in 1270 during his second crusade and he was canonized just 26 years later in 1296. So, here we have two human kings who lived about 300 years apart. Wenceslas died a martyr; Louis died from dysentery. They both lived saintly lives and treated their people well. They were good kings. But make no mistake. They were in charge of their kingdoms. Louis had a lot of help from his mother, especially when he took his throne at the age of 12. But Louis’ and Wenceslas’ words were law. There were no political parties. There was no such thing as liberal and conservative. There were no elections. The king made the rules, even good kings like Wenceslas and Louis. And so it is with Jesus. I think it’s interesting that in this church of statues there are NINE statues of our Lord. But of all the statues of our Lord, the only one where He’s wearing a crown is the one of Him as an infant. Jesus was born a King. The Magii came to visit the manger to worship the newborn king. Herod ordered all the male children killed because he wanted to be sure there was no king more powerful than He was. He was crucified under a sign that said “King of the Jews”. Even His enemies recognize him as a King; a King that they should fear. As much as Jesus loves us and as much as we love Him, He has laid down some rules and as his Subjects (“subjects”. There’s a word that we Americans might choke on) as His subjects we’re supposed to do what He tells us. Those words of Mary’s are just as true today as they were at the wedding feast at Cana. In the first reading today the prophet Daniel prophesies that one is coming like a Son of Man on the clouds of heaven. He will receive dominion, glory, and kingship. All peoples, nations, and languages will serve him. His dominion is an everlasting dominion that shall not be taken away; his kingship shall not be destroyed. In the second reading from Revelations John calls Jesus “the ruler of the kings of the earth.” He’s not A KING, He’s THE KING. THE KING OF KINGS. He rules all the other kings. If Jesus has that kind of power, who are we to not follow His teachings? That’s pretty presumptuous of us…….and VERY DANGEROUS. Last Sunday we heard another reading from the prophet Daniel. He wrote that “Many of those who sleep in the dust of the earth shall awake; some shall live forever, others shall be an everlasting horror and disgrace.” I don’t know about you, but that sounds pretty serious to me. We’ve been told over and over that when we die we’ll either go to heaven or hell. We’ve also been told what we need to do to get to heaven. And the person who’s going to make that call is the King we celebrate today. What we don’t know is how strict a judge He’s going to be. Is He going to be just? Or is He going to be merciful? If Jesus is all about mercy, then nobody will end up in the fiery furnace. But He’s told us that some people will. Remember Lazarus and the rich man? That’s the work of a just God. So, what’s the deal? Is heaven crowded while just a few people are languishing in the fiery furnace? Or is it the other way around. Is hell standing-room-only while just a few of Jesus’ most loyal subjects are sitting at the heavenly table? We don’t know and we won’t know until we end up in one place or the other. I’m thinking that the best approach for us is to assume that Jesus will be just and to do all we can to be on His good side. That means doing what Jesus and His Church tell us to do. Not because He wants us to be on some kind of guilt trip, but because we love Him so much that we don’t want to disappoint Him. Remember, He’s a GOOD KING, not an evil dictator. Before He was murdered, Jesus called the Apostles together and said to them, “whoever hears you, hears me.” That was Him commissioning His Church. Peter became the first Pope and ten of the other eleven became the first bishops. He wanted to leave behind a Church that could speak with authority on His behalf well into the future. His teachings never change, but circumstances, especially ways for the Devil to tempt us, do change. Jesus could see the future. He knew that in a couple of thousand years there would be something called the Internet. There are a lot of good things and a lot of bad things on the web. Jesus could have told the original Apostles how to handle the Internet but they would have had no idea what He was talking about. Instead, He left us with Church leaders who speak for Him on contemporary subjects. Jesus knew that there would be artificial birth control in the future but it didn’t exist when He was walking the earth. Modern-day Church teachers can speak on the subject with His full authority…..And, if we want to stay on His good side and avoid that fiery place, we should listen. So, as we go about our daily lives, it’s important to keep this feast in mind. Jesus is the King of the Universe. He always has been and always will be. When it’s our turn to see him face-to-face, will we hear Him say, “well done, good and faithful servant?” I sure hope so.